This course is designed for beginners who wish to become a Microsoft .NET developer by using C# (C Sharp) which is one of the most popular programming languages for web, desktop and mobile application development. 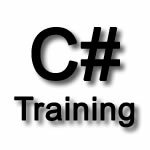 It is a classroom based course that covers the essential topics to start programming with C#. No existing knowledge on .NET or C# is required. Familiarity with any programming language is helpful but not required. You should have basic computing knowledge. From June 2019 the duration of this course will be extended to 15 hours with updated course content. "A very well delivered course covering advanced topics with the bonus of small class sizes. Would recommend." "The course was very good. The teacher (Jayan) was amazing, he let you use different versions of the visual studio, and you don't need to bring your own laptop since they have one for each student, although I preferred to bring my own." The course instructor is a .NET developer with 7+ years of professional experience in developing both Winforms and ASP.NET applications. The trainer is currently working as a Senior .NET Developer for a large multinational company in UK and developed many enterprise applications and participated in every stage of software life cycle.